Serum markers for the diagnosis and monitoring of cancer have been demonstrated to be generally nonspecific (1). The evaluation of circulating immune complexes (CIC) has proven useful for following the clinical course of disease in cancer patients (2–8). High levels of CIC have been indicative of increased tumor burden and poor prognosis in malignant melanoma (9,10), breast carcinoma (11,12), ovarian carcinoma (13), neuroblastoma (14), gastrointestinal carcinoma (15), lung carcinoma (16), sarcoma (105), bone tumors (17), and leukemias (18). 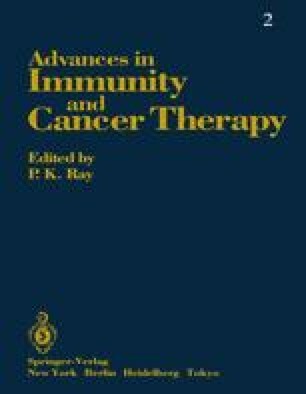 Initially, only tumor-associated antibodies were considered responsible for the immunomodulation observed in cancer patients, but currently tumor-associated immune complexes and their antigens have been demonstrated to have a major “blocking factors” role (19,20,54). Also, CIC have been shown to modulate tumoricidal activity of macrophages (21), natural killer (NK) cells (22), and antibody-dependent cytotoxicity (16,23).